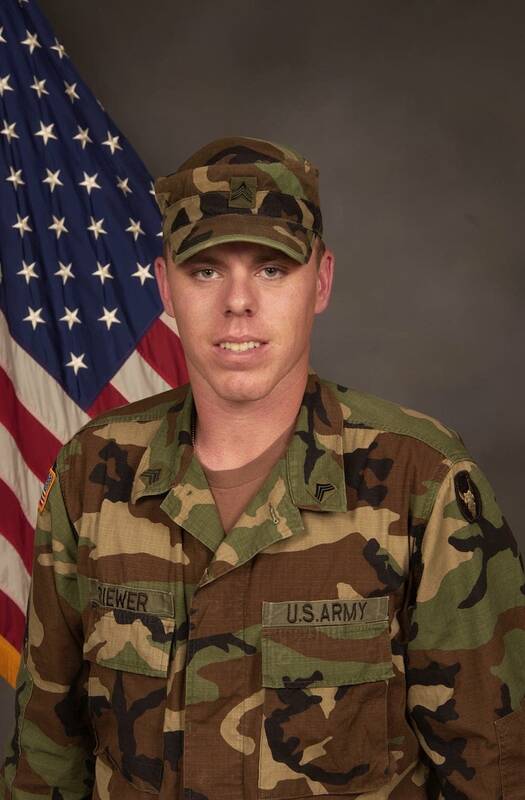 Riewer was on patrol near the Iraqi city of Falluja when an improvised explosive device -- or IED -- went off. Three other Minnesota National Guard soldiers were also wounded in the attack, which is still being investigated. Riewer was one of 13 children. Former Frazee mayor Fred Dagget says the entire family is well-liked in the community. He remembers Greg Riewer as a good kid. "Greg was quiet," he said. "Out of the whole Riewer family, Greg was the quietest one. But just an outstanding community member, and a good guy and never was in trouble, never anything derogatory; just a good guy." Riewer enlisted with the National Guard soon after graduating from Frazee High School in 1997 and served in Bosnia from 2003 to 2004. This was his first tour in Iraq. He was deployed in March 2006 as part of a company that provides support to the Second Marine Expeditionary Force. His unit is involved with training Iraqi soldiers, providing base security and combat support. Col. Kevin Gutknecht had the job of announcing Riewer's death on Saturday night in St. Paul, including reading a statement from Riewer's family. "Greg had a big heart and was always quick to help those in need. He was part of a large and close-knit family that misses him deeply and is devastated by this loss. The family asks that you keep Greg and all military personnel in your thoughts and prayers," it said. Riewer was always smiling, something that earned him the family nickname of "Smiley." His father said that his son seemed to be the most free when he was riding his motorcycle. He also loved sports and hunting. Riewer was part of a Moorhead-based battalion with units across northwestern Minnesota. He was scheduled to come home this spring, but like other Minnesota National Guard soldiers, his tour was recently extended. Gutknecht says it's impossible to know whether Riewer would have been home by now were it not for the extension. "I think the death of a soldier in combat like this is difficult to swallow at any time. And no more no less because of the incidents that occurred with the extension," he said. In a statement on the Minnesota National Guard Web site, Riewer's mother, Janice, wrote. "A mother couldn't ask for a better son; always loving, always caring, always there to help everyone." His father Richard, wrote, "With eight boys, one doesn't want to lose any of them. He was always ready to help with whatever and never complained. I will miss him horribly." Riewer was unmarried and had no children. He is the 12th Minnesota National Guard soldier to be killed so far in Iraq. Thirty-five active duty members of the military with strong ties to Minnesota have also been killed in the war. Former Frazee Mayor Fred Daggett says Riewer's death is already affecting the small town in a big way. "It's overshadowing the whole community and it's been solemn feeling over the whole community since Friday," he said. "You hear about these tragedies happening throughout the United States, but until it happens in your home town and you know somebody, you really don't quite know how they're feeling. So to a lot of us, it's first and hopefully the last." The Riewers also have another son currently serving in the Guard: Greg's younger brother, Andrew. Dagget says Andrew was scheduled to fly home from Iraq on Sunday night. His family was chartering a bus to pick him up and take him home.